Daud Akhriev was born in the former Soviet Union in 1959. He studied classical painting and drawing for 14 years, eight of them in St. Petersburg, Russia. In that city he received his masters degree with honors from the Repin Institute, under the tutelage of the late Piotr Fomin. In 1991 he emigrated to Chattanooga, Tennessee and has remained there since. Akhriev, now a U.S. citizen, spends his summers painting landscapes throughout the world with his artist wife and son. During the rest of the year Ahkriev paints in his Chattanooga studio. ? ?In 2007 Akhriev won an award of excellence from Oil Painters of America, and Second Place in the Greenhouse Gallery's Salon International, in San Antonio, TX. Greenhouse has twice included Akhriev's work in International Masters, an invitational exhibition. ?In 1993 the Hunter Museum of American Art presented a solo exhibition of Akhriev's work. His is on regular exhibit at Miller Galleries located in both Cincinnati Ohio and Winter Park Florida. In April, 2006, Miller Gallery presented a solo exhibition of Akhriev's work. 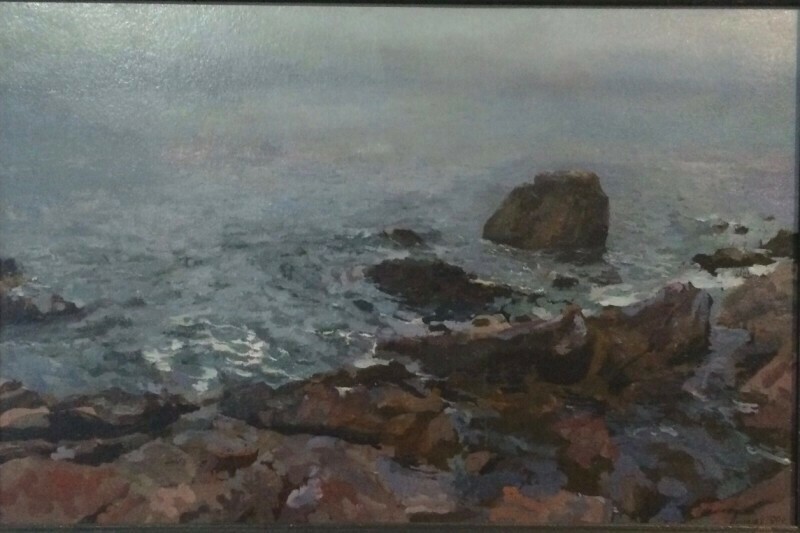 He also has paintings at Turtle Gallery on Deer Isle, Maine. The Chattanooga Symphony and Opera Guild honored Akhriev as one of Chattanooga's master artists in Music and Masterpieces, 2006. He has participated in group shows in New York, London, Zurich, Oslo and around the Southeastern United States. 2006 Group shows included Oil Painters of America annual juried show in Mazula Montana (International Artist award of Excellence), and "Salon International" at Greenhouse Gallery in San Antonio (awarded Juror's top 50 and Honorable Mention), and a show in Almaty, Kazakhstan with two colleagues from St. Petersburg, Russia.? ?Akhriev is trained in monumental public art, and has four murals in Chattanooga: the Collegedale Seventh-Day Adventist Church, the Samaritan Center and St. Peter's Episcopal Church.? ?Akhriev has taught summer courses in landscape for the Florence Academy of Art, in Florence, Italy. In 2003, Akhriev and his wife were Artists in Residence at the Robert M MacNamara Foundation in Westport Island, Maine, for six weeks. He has taken small groups of painting students to students in Tuscany in 2004-2006. The University of Tennessee Chattanooga has invited him to be a guest instructor in their painting program. ? ?Artists Magazine featured Akhriev in the February, 2006 issue. His work is in two books in English. Daud Akhriev, Stylistic Pluralism was published in 2002 by CommonPlace publishing. He is also featured in Traditions Rediscovered, the Finley Collection of Russian Art. Akhriev's drawings are in several books about the Repin Institute, both in Russian and in Chinese. ?